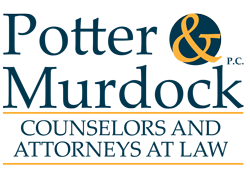 GOVERNMENT CONTRACTS - Potter & Murdock, P.C. Potter & Murdock represents government contractors of all sizes in the United States, Canada, and other countries regarding contracts under a variety of NAIC code categories, including the codes applicable to: utilities; construction; manufacturing; transportation and warehousing; communications; information technology; professional services; real estate sales, rental and leasing; and health care. The firm’s clients serve as both prime contractors and subcontractors on civilian and military contracts as well as on state and local contracts. The federal contracts are with various agencies, including the Department of Defense (“DoD”), Treasury, Homeland Security, General Services Administration (“GSA”), Housing & Urban Development (“HUD”), Department of Agriculture (“USDA”), Department of State, and the Federal Bureau of Investigations (“FBI”). The firm’s clients provide a broad range of services and goods to the various agencies, including IT; medical and non-medical staffing; mission support, both CONUS and OCONUS; facility operations and maintenance; help-desk services; military operations support; logistical services; research and development; training; communication; and construction. Federal and state procurement contract formation, including legal review of requests for proposal, requests for quotes and invitations for bids. Sole source contracts and Other Transactions Authority contracts. Teaming agreements, strategic alliances and joint ventures. Performance disputes, including disputes between prime contractors and subcontractors. Termination of contracts, including termination for convenience and default. Protection of intellectual property under government contracts, including technical data rights, copyright protection, contractor patent rights, and trademark and trade secrets protection. SBA issues including minority-owned and women-owned business set-asides, 8a and Service Disabled Veteran-Owned Small Business (SDVOSB) certification, mentor-protégé relationships, and small business size standard issues. Export and import issues, The Trade Agreements Act, The Buy American Act, ITAR and FMS issues. GSA Schedule Contracts, Indefinite Delivery/Indefinite Quantity (IDIQ) contracts, and other multiple award contract issues. Litigation of bid protests and claims and disputes before the GAO, the Board of Contract Appeals, the Court of Federal Claims and various other federal and state courts.